Right now one of the bandwagons gun writers are jumping on is the perception the HK VP9 is the “greatest striker-fired gun ever!” This is a mystery to me not only because just about every other gun company is already making a polymer-framed, striker-fired gun, but also because most of them are as good as or better than the HK VP9. One of those is the FNS from FNH USA, but it hasn’t gotten nearly the press and attention as some competing designs. Now that FNH has introduced a compact version of the FNS—the FNS-C—perhaps this perception will change. The FNS is a full-size pistol, a great duty gun but a little big to carry concealed. The FNS-C is reduced enough in size to be easily concealed, but it’s still large enough to be comfortably shot. It is appropriately named a “compact.” It’s small enough to conceal well in a holster or in a bag or purse, but it’s not a “pocket gun” because it’s too big and heavy for that. FNH has a history of producing firearms for government contracts (it was the U.S. military’s M4 supplier for many years), so I’m not surprised a full-size duty gun was the first FNS model introduced. I’m also not surprised the firm has followed up with a version aimed at the huge U.S. concealed-carry market. FN Herstal is a Belgian company, but its FNH USA subsidiary is based in Virginia, and the FNS and FNS-C are made in the USA. The FNS has a 4.0-inch barrel; the new FNS-C sports a 3.6-inch barrel. The designers did away with the small beavertail at the back of the frame. The end result is a pistol more than half an inch shorter up top. But the biggest difference is in the frame, which is almost an inch shorter, and it is the frame much more than the slide that determines how well a pistol can be concealed. The FNS-C is available in 9mm and .40 S&W. I received the 9mm version (officially the FNS-9C) to test, and it weighs 23.4 ounces empty. FN pistols have a similar look, distinctive and spare. The lines of the FNS slide are mostly straight, with few curves anywhere on the gun other than the backstrap and the large oval trigger guards. The FNS-C has the exact same look, although the upper portion of the slide is slightly narrower than the bottom, which gives it a stepped look. The top of the FNS-C’s slide is flat, which aids in aiming as your hands come up and your eyes look for the sights. As for sights, the FNS-C has an excellent set for a factory gun. They’re steel three-dots, with a no-snag rear and post front, both dovetailed into the slide. The notch in the rear sight is wide with a shallow V shape to the bottom, and the rear of the sight is serrated to reduce glare. The white dot in the front sight is larger than the two in the rear, making it easy to pick out. I prefer a plain black rear sight as the rear sight should be used as a window frame—you look through it, not at it—but having a larger front sight dot is a good compromise. These pistols are available with night sights as well. The slide is stainless steel with a matte black finish. (Versions of this gun are available with a polished silver slide.) The cold-hammer-forged barrel is stainless steel as well, with a black finish. It has an external extractor with a loaded chamber indicator. The slide has angled, flat-bottomed cocking serrations front and back, with the FN logo on the left side. Fit on my sample pistol was excellent. There was just the tiniest bit of play between the slide and frame, and the barrel locked up solid. With the slide forward, I couldn’t get the barrel to move at all by pushing down on the hood, which, short of shooting, is the only sure way to predict the accuracy of a pistol. The barrel has an integral feed ramp, and both it and the chamber are polished. Working the slide takes a bit of effort because the FNS-9C comes equipped with a dual recoil spring. While this pistol is American-made, the company has European roots, and European gun companies love to equip pistols with recoil springs measured in metric tons. These are captured recoil springs in a steel guide rod assembly. Like all striker-fired guns the slide rides on steel rails set into the polymer frame, but the FNS-C frame rails are replaceable and not molded into the frame like they are on many other polymer guns. FNH USA has plans to sell versions of the FNS-C with an ambidextrous manual frame-mounted safety at the top rear of the frame, but this pistol was not so equipped. The controls it does have are rather simple: an ambidextrous slide release and an ambidextrous magazine release, in addition to a takedown lever. The magazine release I find a bit weird in shape and function. The release button itself is steel and teardrop shaped, with a serrated surface. It does not project far from the frame, and I think it doesn’t project enough. When pushing it in far enough to drop the magazine (which is quite a ways and required me to break my firing grip), I found the opposite side of the ambi safety pushing against my middle finger. The slide stop is just that—a stop and not a slide release. Don’t try releasing the slide by pushing down on it because there’s just not enough there for purchase. It is further protected on either side by polymer wings. Once you’ve inserted a fresh mag just give the slide a tug to chamber a new round. FNH USA describes the FNS as having a double-action trigger. It sure seems like the striker is slightly pre-cocked inside the slide before trigger pull, so I don’t know if technically it is a true double action. There is no restrike capability like you’d get with a double-action revolver; if you pull the trigger and nothing happens, you’ll have to work the slide to get going again. The more important question is, What’s the trigger pull like? Fear not, the FNS-C does not have a revolver-esque long, heavy, double-action trigger pull but rather one similar to all other striker-fired guns: a bit of plasticky take-up, then a slightly “sproinky” break. FNH USA advertises trigger pulls between 5.5 and 7.7 pounds for the FNS-C. Total pull weight on my sample was exactly 6.5 pounds, which is the same advertised pull weight for Smith & Wesson M&Ps and Springfield Armory XDs. Total trigger travel including take-up was half an inch, with a quarter-inch reset. For the trigger pull of a polymer-frame, striker-fired gun, it was boring and average in every way—which isn’t a bad thing. The trigger itself is all polymer with a wide, rounded face. The trigger is hinged in the middle (the pivoting lower half features a drop safety), but you can’t feel the hinge while shooting. The trigger guard is oval in shape and wide. The front of the trigger guard is serrated for those who shoot with a finger-forward hold. The front of the frame is covered with small, horizontal serrations that aren’t as aggressive as I would like, but the rest of the frame makes up for it. Both sides and the backstrap are covered in raised squares, almost like disarticulated checkering, that do an excellent job of gripping the hand. The front of the frame has a three-slot MIL-STD 1913 tactical rail for mounting lights, lasers and combo units. The frame features interchangeable backstraps, and two were provided with the pistol. I would consider them medium and small; the medium is what comes installed on the pistol. The full-size FNS backstraps have lanyard eyelets, but they are not present on the Compact. The magazine well opening in the frame has been beveled to smooth reloads, which is a nice touch. As for the magazines, the full-size 9mm FNS had a 17-round magazine, and FN earned big kudos by supplying each pistol with three magazines. The FNS-C in 9mm has a flush magazine capacity of 12, and it also is supplied with three magazines—but each magazine is different. 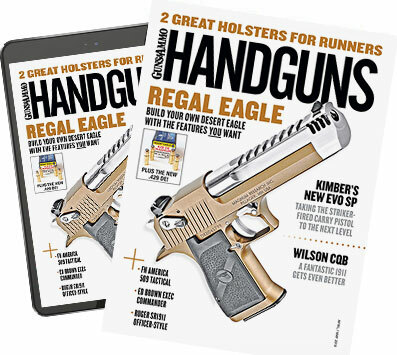 The first magazine is a 12-rounder with a flush-fitting base pad. The second magazine is a 12-rounder with an extended finger hook polymer base pad. The third magazine is a full-size 17-round FNS magazine with a polymer grip sleeve. I don’t have large hands, and for reference, I wear medium gloves (at least according to Mechanix sizing). With the flush magazine in place, I can just barely get all my fingers on the gun, although because the base pad protrudes a bit from the front of the frame it isn’t as comfortable as I would like. If this was my gun, I would grind down a bit on the front of the base pad so it fit flush with the front of the frame. With the finger-hook magazine in place, I can easily get my whole hand on the gun, and I presume this is how most people will shoot and carry this gun. The base pad is angled so it won’t print any more than the flush base pad. The 17-rounder with grip extension is a great magazine for a backup reload. The magazines are steel with a cool blackish-purple finish. They have black polymer followers and numbered index holes to the rear. My first trip to the range reinforced my opinion that the finger hook-equipped magazine will be the most popular one among FNS-9C owners. The flush magazine just didn’t give me the kind of control I wanted over the gun when shooting. While “only” a 9mm, it is a compact pistol with a polymer frame, which means it is light. The extended floorplate made my hands much happier and gave me much more control. Muzzle rise was sharp when shooting +P loads, but the gun was not hard on my hands even with the hottest ammo. I had no problems seeing the big dot on the front sight when doing rapid-fire drills on USPSA silhouettes or while knocking down steel. The FNS-C is definitely big enough to shoot accurately at distance while being small enough to carry concealed with the right choice of holster and clothing. One thing to remember when shooting and carrying compact models is you will take a slight hit when it comes to velocities. Most advertised velocities of ammo are generated by five-inch test barrels. As an example, Hornady’s 124-grain XTP +P load is advertised at 1,200 fps, but out of the FNS-9C’s 3.6-inch barrel, it averaged only 1,063 fps. Still respectable performance, but also something to take into account. The FNS Compact has distinct FN looks and is a solid performer. Big enough to shoot, small enough to carry, supplied with any kind of magazine you might want, all for a competitive price. FNH USA has not reinvented the wheel with this pistol, but it does give gun owners interested in a handgun for self-defense another quality option. And more choices are always better.